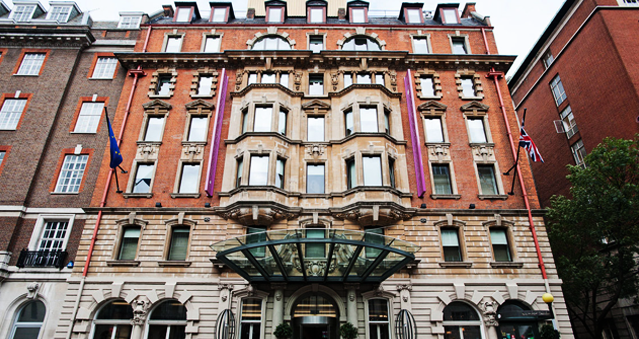 Location is key, Oxford Street, Covent Garden and Soho are within easy reach and the hotel is just a 5 minutes stroll from Euston Station, King’s Cross St. Pancras Station (Eurostar Terminal) and Russell Square tube station. Overlooking a quaint Dickensian lane in the Bloomsbury literary district, this 19th-century hotel with a grand exterior and a modern contemporary interior is a 3-minute walk from Euston. Italian architect Guiseppe Boscherini has created a fresh, contemporary design to meet the needs of a highly discerning corporate and conference market. The hotel offers 100 rooms spread over 6 floors. Facilities and amenities include conference and banqueting for up to 250 delegates, air-conditioned common areas, a restaurant and Internet. No two events are ever the same at Ambassadors Bloomsbury, and their food and drink options reflect companies meeting’s individuality upholding the healthy eating preferences of today’s conference delegates. If you are looking for an exceptionally well connected venue for your conference/meeting or team building event, then Ambassadors Bloomsbury really hits the brief. Ideal for: The Killing, Awakening the Dead, Around the World, Real Life Clud’oo, Crime and Dine, Murder Mystery, GPS Treasure Hunts, Conferences and Christmas Events. If you would like to hold your next event at Ambassadors Bloomsbury, contact us on 0207 1676 717 or email us info@rightangleevents.co.uk.